You will find three different techniques to import-export data between Microsoft Excel and SQL Server/SQL Azure using Visual Studio Tools for Office solutions and useful developer tips. You may download a working example to test the techniques with a little time. SQL Server data import to Excel. SQL Server data refresh in Excel. 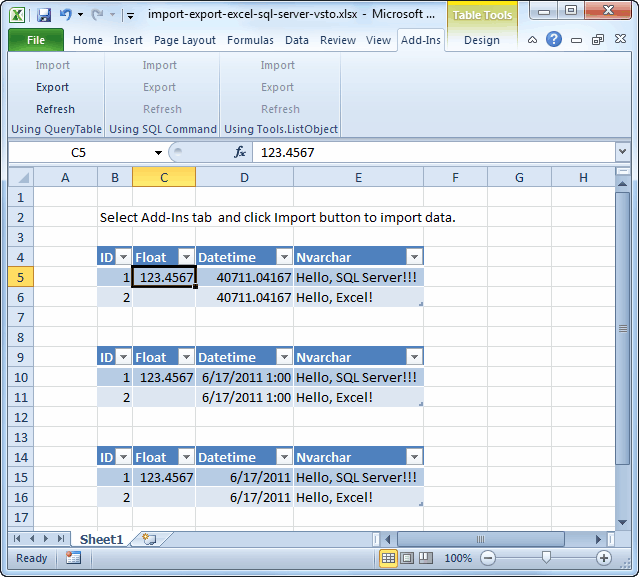 Excel data export to SQL Server. Use of a native Excel ListObject object with QueryTable connected to a database table. Use of a native Excel Range object with fully programmed control. Use of a Visual Studio Tools for Office ListObject object with DataSource connected to a database table. Each approach requires the coding and has the both advantages and disadvantages. A native Excel object is used. So users feel a "native" interface with extended features. A workbook can be used without VSTO customization for data refresh as a regular workbook. The QueryTable object does not support the data change tracking features. So a developer should code the logic for server data update. The simplest way to update server data is to export the entire Excel data to a temporary database table and then use a stored procedure to update a source database table using the temporary data. The Excel part of an application is quite universal. The business logic is implemented in a database. Full control over the imported data, maybe. A program data refresh is required. So users should use a non-standard action for a standard feature. The way to solve the data change task is the same as described above for the QueryTable object. A ready functionality of the data changes tracking and a data source update. A ready functionality of the data constraints and data relations validation. An additional coding is required to save and restore VSTO and .NET objects between workbook Close and Open events as Excel does not store this information. This approach is very similar to a traditional .NET data application programming. The most complicated task is a data store in a closed workbook which has no standard solutions. You may download a working example of described import-export techniques. The example is a Visual Studio 2010 document-level customization project. On the screenshot below the three data tables has been inserted using different methods. The ribbon is sensitive to the selected cell and enables only available options. If you only start a project, you should make some technical decisions. I would like to share my personal views on some aspects to help you. The decision about the Visual Studio project type depends on the project task. I like the both languages. However, I strongly recommend using Visual Basic for Microsoft Office projects even you are new to VB. You may use the Excel Macro Recorder to build a code sample. Then you can change the sample code to a working one with a little time. You may find on the Internet and adapt a huge amount of VBA code for different tasks as VBA has a long history. You may test your ideas right in the Excel Visual Basic Editor. My personal productivity increases significantly when I switch to VB for Microsoft Office projects. Visual Studio 2010 is perfect for Microsoft Office projects unlike Visual Studio 2008. In addition .NET Framework 4.0 is available in vs. 2010 only. .NET Framework 4.0 is rather different from .NET Framework 3.5. I think that .NET Framework 4.0 is the best solution. Use the following configuration steps before the project start. Create a ListObject using CreateQueryTable function. Use the Excel standard feature to refresh data. Use ExportRangeToDatabase function to export data to a database table. Insert database table data to a range using the ImportSQLtoRange function. Use the same function to refresh data. Data export requires additional stored procedures to update database table data. See the ExportRangeToDatabase function description. The function creates an Excel native ListObject with QueryTable connected to the OLE DB data source specified by the connectionString. The result is nearly the same as a result of the standard Excel connection dialog. &apos; lo.DisplayName = ws.Name & "_Table"
The function inserts the query results to the target range. LastErrorMessage is a global variable that contains the last exception message if the function result is not zero. ExecuteOleDbDataReader is a function that processes the result OleDBDataReader using the OleDbDataReaderToArray delegate function and arr as input-output object. The query results are read into an array, and the array values are inserted to a range using Range.Value property very fast. In the end, the target range is converted to a ListObject. The function exports the sourceRange data to a table with the tableName. The optional beforeSQL is executed before the export, and the optional afterSQL is executed after the export. Delete all data from a temporary import table. Export Excel data to the empty temporary import table. Update desired tables from the temporary import table data. Specially developed stored procedures are used in the first and third steps. Moreover, a universal code is used to transfer Excel data to a destination table. &apos; Set the range before .Match call! The main idea of the function is the use of the standard DataTable, DataAdapter and CommandBuilder objects to export the range data. The preliminary column mappings is used for fast transfer of Excel range column data to a datatable column. Excel can hold date and time values as a double. So database date and time types are checked and DateTime.FromOADate function is used when the Excel cell value is double. Do not use date and time database types if possible. Use general datetime type that has a full Excel equivalent. Otherwise, periodical convert problems will appear. The function implements a common logic for the ExecuteReader command and calls the input processor delegate function to execute a data reader processing. See an example of a delegate function below. context is a parameter that can hold any input-output data. The function is used as a delegate for ExecuteOleDbDataReader function and reads the dataReader data to a context array. The transposed array is used as only the last array dimension can be changed and the second dimension is used for the unknown count of datareader rows. See a use example in the ImportSQLtoRange function description above. This is a simple function that constructs an OLE DB connection string suitable for SQL Server/SQL Azure connection using OleDbConnection object and Excel QueryTable one with "OLEDB;" prefix. For SQL Azure TrustServerCertificate=True is used. This is less secure, but the False option can cause an SQL Azure connection problem. Use the ImportToolsListObject function to insert a data table connected to a database table. Use the RefreshToolsListObject function to refresh data table data. Use the ExportToolsListObject function to export data table data to a database table. All the VSTO and .NET Framework objects are alive only at the VSTO customization run-time. So the developer should care about the save and restore of the objects. The save and restore logic is not implemented in the example. The function creates and fills DataTable, DataAdapter and CommandBulder objects. Then the function creates VSTO ListObject for input VSTO WorksheetBase and sets the DataTable as ListObject DataSource. The DataAdapter is added to DataAdapters SortedList collection for further use in the ExportToolsListObject and RefreshToolsListObject functions. This function updates the source database table with VSTO ListObject dataTable changes. The database connection is restored before the update and is closed after. The dataTable is cleared and refilled to get updated database data. LastErrorMessage = "There are no DataAdapters"
The function clears and refills VSTO ListObject DataSource to get updated database data. The article describes the solutions for three typical tasks: import, refresh, and export for three approaches: using native Excel QueryTable and Range objects and VSTO ListObject object. You may use any approach in line with your tasks. Download the complete Visual Studio 2010 project to quick start.